The 21st century is one that is moving at the speed of light when it comes to innovation and modernization of everything from cars to telephones. With advancement in technology comes the brilliant minds of those inventors who are all about creating things to make your life easier, without you even realizing you needed such a thing in your life. The following inventions are a combination of ‘how did I not think of that? !’ and ‘this is so brilliant I have no words!‘. Futuristic films and television shows from decades past have depicted many inventions that are very much real today. That being said, there are many inventions being created today that work well with the younger millennial and generation Z demographic. As advanced continue to make way, more and more things that took a lot of time will get done in minutes, while things that were thought to be impossible are now very much an ordinary part of our lives. It is part of evolution that technology will be made to be the right hand man of man himself. We create these inventions to make our lives easier and more comfortable, otherwise there would be no incentive. Some inventions are for discovery of other things that are still a question for us today. There are some inventions on this list that make the lives of our pets better, of our children better, and all of them are all about comfort. While we have yet to invent a way to teleport, read someones mind, flying cars, and automated everything, we are sure on our way as a species to achieve such incredible feats. Until such a time, we will work on how to iron our clothes and turn the board into another mechanism, or a candle that is never ending. You know how you get to the end of the candle and have to throw it out? Well, you don’t have to do that anymore thanks to The Rekindle. 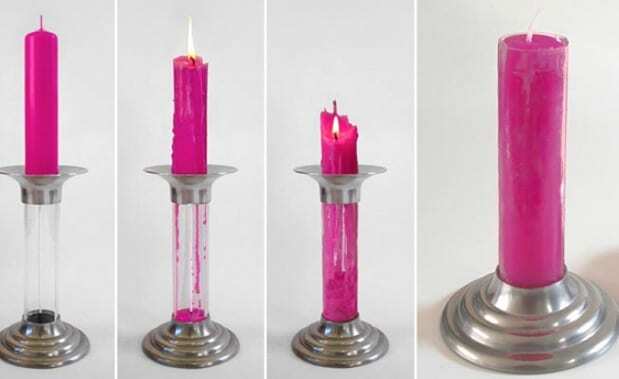 This candle captures its own wax emissions and reforms the candle from the melted wax below! This is not only super efficient but is also low on waste so is also better for the environment. This is what we like to call a win-win. What do you do when a friend asks you to get them coffee, or perhaps your boss, and it’s raining outside? 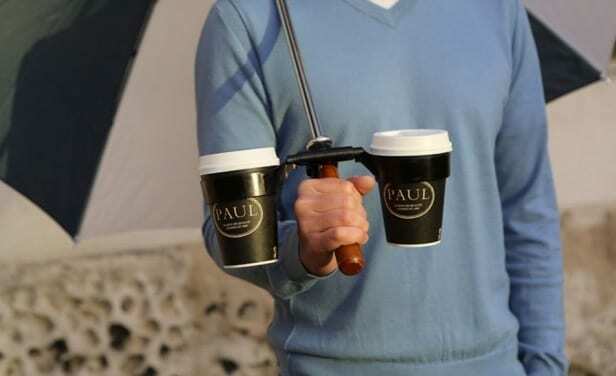 Well, before this awesome invention, you would get very wet while holding your cups of coffee to the office, but thanks to this epic invention you can now get the coffee and simply place it in your coffee holders that are attached to you umbrella! Where has this been all our adult life? We have yet to find a way to not cry while chopping onions, but someone did think ahead and invented the onion holder to have an easier time with the slicing. 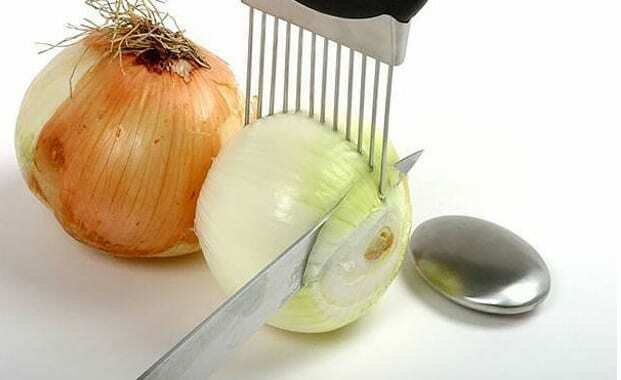 The comb-like invention keeps the onion in place while you use your knife to cut through the teeth of the comb, thus slicing the onion without it going anywhere, or in our case, rolling on the floor and needing to be rewashed before attempting to slice it again. Get your own move on when you take your little one out in their stroller. 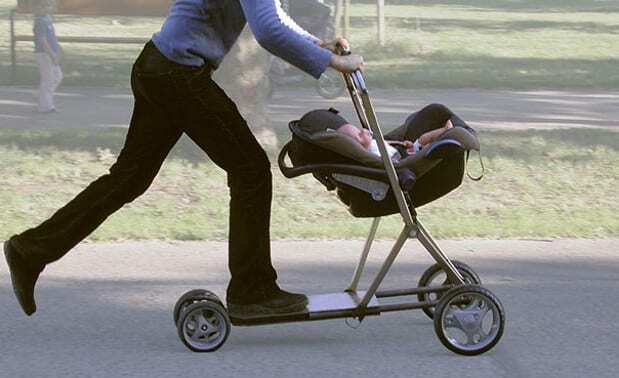 The Roller Buggy attaches the baby seat to a modified scooter for maximum speed and movement for both parent and child. You can easily get to the other side of the park faster, or anywhere else for that matter, while also doing a little bit of a workout at the same time. We are certainly going to keep this one in our arsenal when we have children. 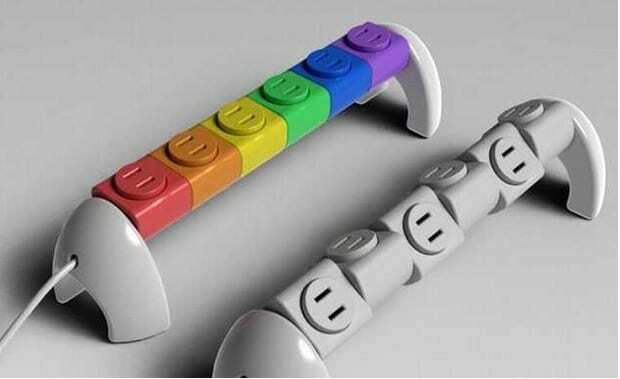 The Rotating Power Strip by Quail Electronics is the perfect solution for using every single outlet despite having a larger than usual (such as laptop) charger that would normally block another outlet from being used. The rotating feature allows you to move the outlet to the direction it needs to be in so it doesn’t collide with anything else, plus, if you’re anything like us, you will have your phone charger plugged in and in the direction of YOU. 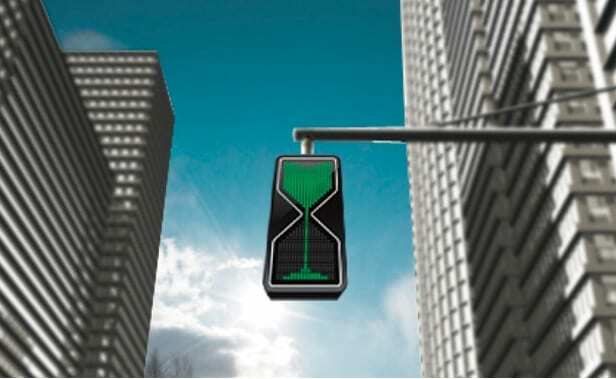 Yanko Designs thought it would be a good idea to create a new kind of traffic light, one that would show you how much time is left in each of its states – green, yellow and red. This is a great invention for those itchy drivers who don’t like red lights or those who have a few seconds to run through a green light before it turns red. This has yet to be implemented but there is a push for it. Cutting through a pizza, especially a deep dish, is some serious business. 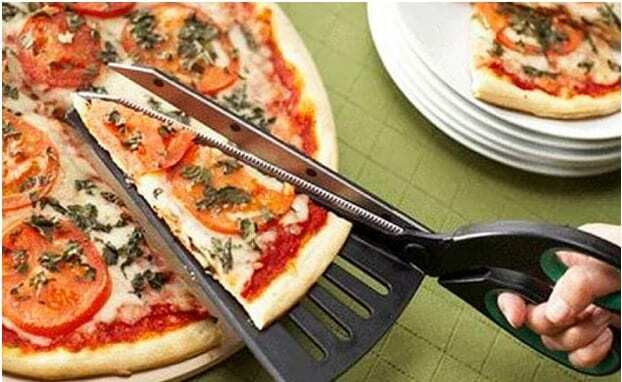 These pizza scissors do the job of cutting and dishing out your pizza without a mess and all in one little gadget. The added spatula feature means you can cut and serve the pizza in a very comfortable and mess-free way. We all love pizza, and whoever doesn’t has no business at our table anyway. 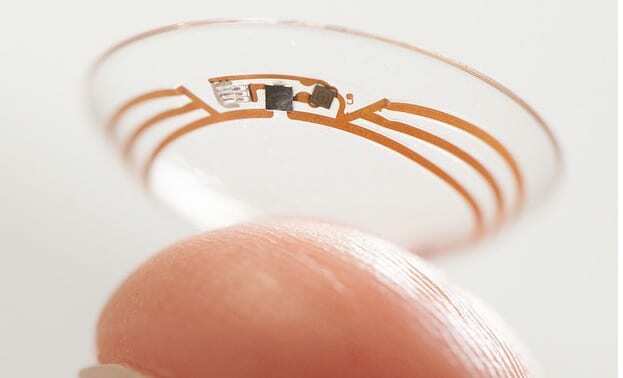 A medical gadget that can seriously save lives – a smart contact lens made for diabetics that measures your glucose levels and advises you if they are in good or bad standing. This is instead of pricking your finger multiple times a day in order to measure the blood glucose levels. 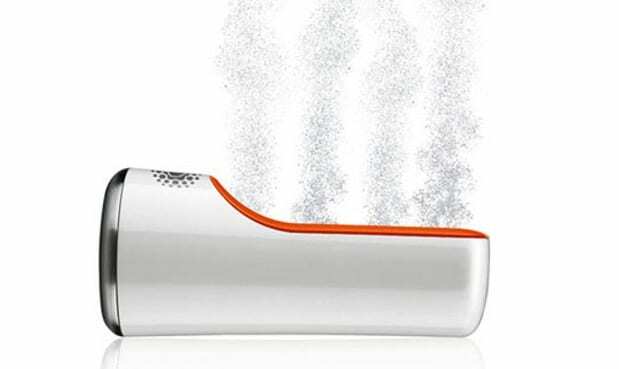 This invention is much more than convenience, it makes a difference int he life of a diabetic. The lens will change color based on the glucose levels – brilliant! Any parent knows that there is little more comforting or distressing for a child than the perfect or wrong bath water temperature. 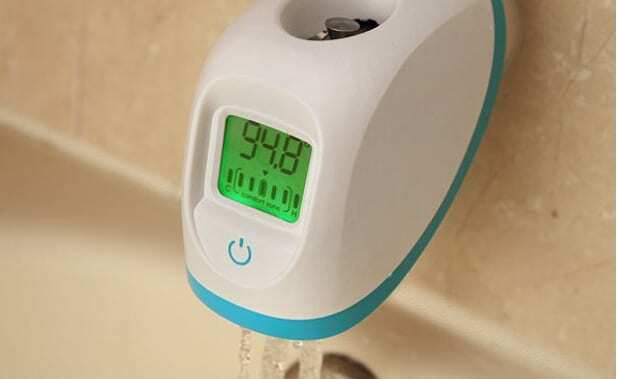 This faucet thermometer solves the issues of water temperature by telling you exactly how hot or cold the water is and what the optimal temperature should be for the situation. No more guessing – which is a great time saver and tantrum preventer for any parent as well. Ever get us up in the middle of the night for a glass of water or the bathroom? Yeah, us too. How many times have you bumped into the corner of the bed or table and had to waddle your way through the house all grumpy about hurting your baby toes? Once again, we have too. This invention makes getting up mid-night a breeze. 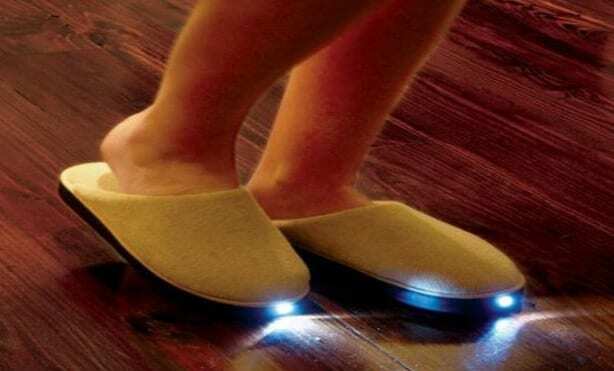 The LED Slippers will illuminate the way to the kitchen or bathroom so as to make sure you bump into nothing unexpected. When it’s raining and you have your umbrella open it protects you from getting wet. When the rain stops, there is little more annoying than carrying your umbrella around all day. 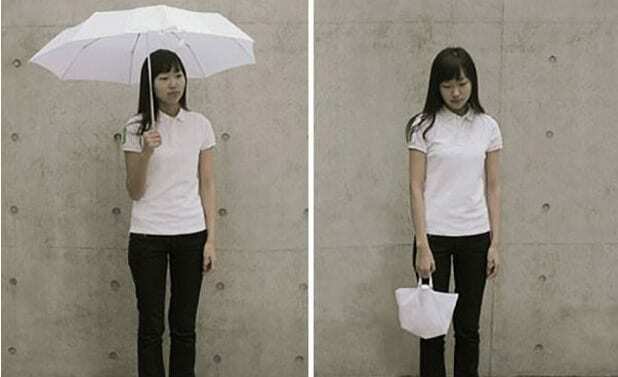 This company decided that it would be a good idea to create an umbrella that turns into a bag – women everywhere rejoice! This photo gives us a prefect example of what it looks like and we have to say it seems pretty comfortable. If you are a parent you have legos in your home, and you always misplace your keys. 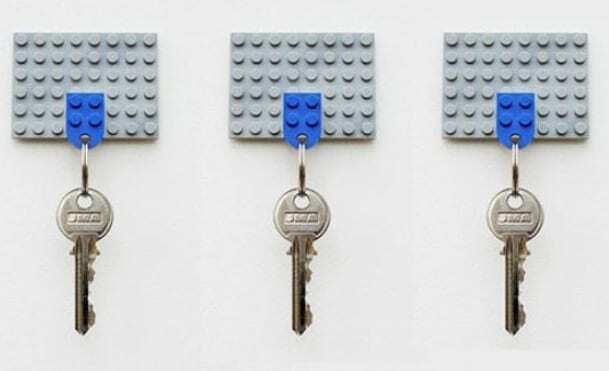 Here is a two in one solution for the double problem – a key holder made out of legos! Just take the legos you pieced together and paste them to the wall. Take another piece of lego and make it into a key chain that you can then piece into the holder when you get home. We are very protective of our coffee, but this is a whole new level of coffee protection. This lockable mug means that no one will EVER dare steal your mug again! 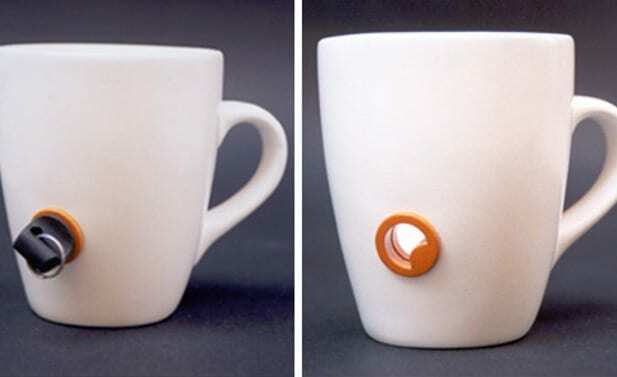 The point of this invention is to lock your mug when you are drinking your coffee and removing the key to create a whole for when it is not in use, that way no one else can use it either! Excuse us while we order this right now. Don’t touch my ice cream! 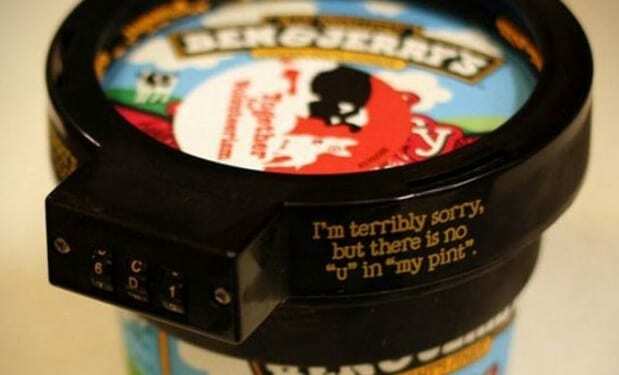 Ben and Jerry’s thought it would be a good idea to create a lock for their ice cream pints with a sentence reading: “I’m terribly sorry, but there is no ‘u’ in ‘my pint'”. So very true! This would have been very useful in our college dorm room since the ice cream always seemed to disappear faster and faster, especially in the summer months. The bathroom mirror goes through so much in its rough existence. Between the steam from the shower and the tooth paste that somehow ALWAYS gets on the mirror, cleaning is an important thing. An inventor thought this exact thought and created the mirror mist wiper that is essentially a giant wiper like those on a windshield of a car. The photo explains how it works – connected at the top of the mirror and swivels to wipe it clean. Babies are sensitive, heck even we don’t like getting soap in our eyes. 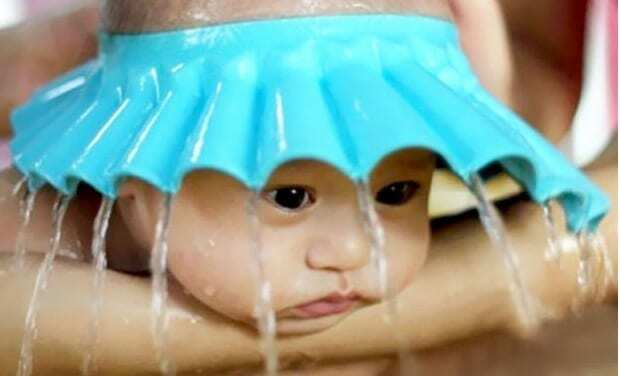 this baby umbrella hat for the bath is a smart way to keep the water and soap out your little ones eyes and face until you want to wash their face in particular. This little babe looks totally relaxed in the bath, working his or her zero fear of water in their face since the hat is doing its job. One of our biggest dreams is to do a cross-country road trip. 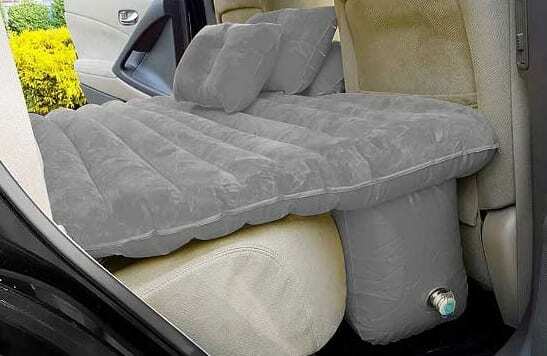 This inflatable car mattress is the perfect invention for those of us who want to sleep in our car along the way – our own little version of glamping (glamorous camping) so as to not sleep on the ground or spend time opening up a tent and closing it back up in the morning. The mattress fills the areas in the back seat of your car to perfection so you have a comfortable spot to lay your head on at night. This one has been around for a while but is extremely underrated and appreciated. 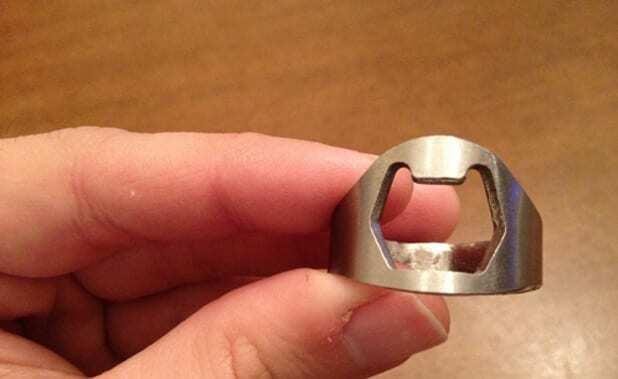 The bottle opener ring is your best friend at parties when the bottle opener cannot be found and you want to open your cold bottle of beer. You will be the lifesaver of the party with this ring – everyone will come to you for their bottle opening needs, how cool is that? We were taught to eat our spaghetti with a fork and a spoon, that way you twirl your fork on the spoon and collect the spaghetti in the most humane way possible (otherwise you could end up looking like an animal). 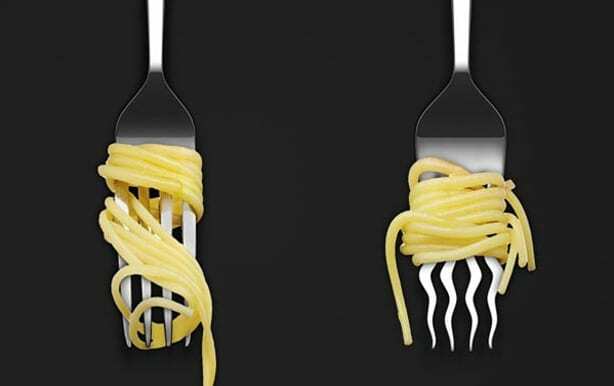 However, this little fork gadget makes spaghetti collection easier than ever with its specially designed wavy fork. The fact that the fork isn’t straight prevents the spaghetti from falling off! This water sterilizer is called the WOW Water Sterilizer. It is used for removing bacteria from your food (fruits and veggies anyone? ), appliances, toys and practically everything. It uses water to produce the sterilization process and does not use chemicals to clean. This is good for all those germaphobes out there who want everything as clean as can be without harming themselves or the environment. There are cities around the earth that have a huge biking culture. With that biking culture comes those who want to run bikers off the road or complain that they are in their way when driving. 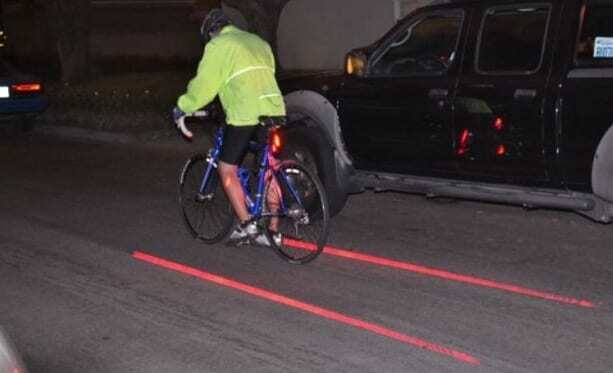 In order to keep bikers safe and their rights for riding as well, the company invented a laser bike lane that is illuminated from the bike and follows it along its route. The red lights make it known to drivers around the biker that he is there. Sipping coffee is one of our favorite things to do, but sometimes we tend to drip it on ourselves or our desk and that’s just annoying. 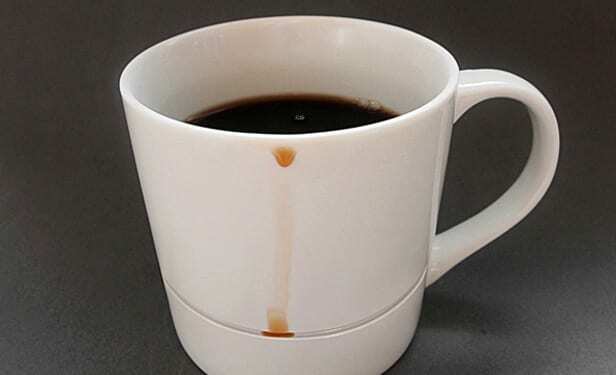 This invention catches the drips off your coffee mug and saves you from finding another shirt to wear. This invention was created by Kim Keun Ae, a Korean designer who must have dealt with this herself and wanted to find a way to keep her area and herself coffee drip free! Iron your piece of clothing and then turn the board over to see yourself in the opposite side’s reflection since it’s a mirror! Part of being an adult, which we have to admit we hate, is ironing your clothing and looking presentable. 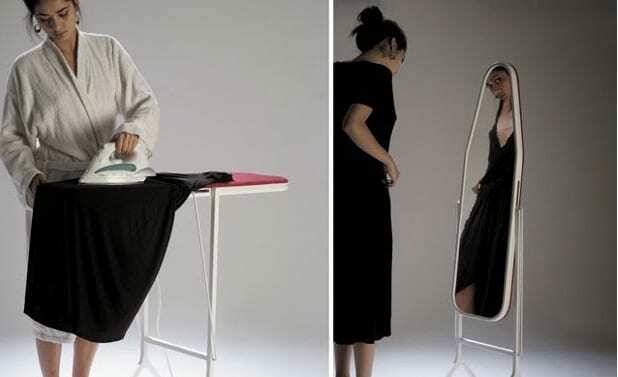 This invention makes it easy to iron your clothing and make sure you look great before your turn the iron off thanks to the mirror on the other side. A controversial invention, this one! The FlaskTie is an actual neck tie that has a concealed flask inside that can hold anything you want it to, although we have a feeling it’s meant to hold a good scotch or wine. We have to admit that this seems to be a classic American college boy move to attend a function looking all spiffy but actually hiding a flask in your tie. A house for a cat takes up a lot of space, space that we know to be very valuable in any small apartment. 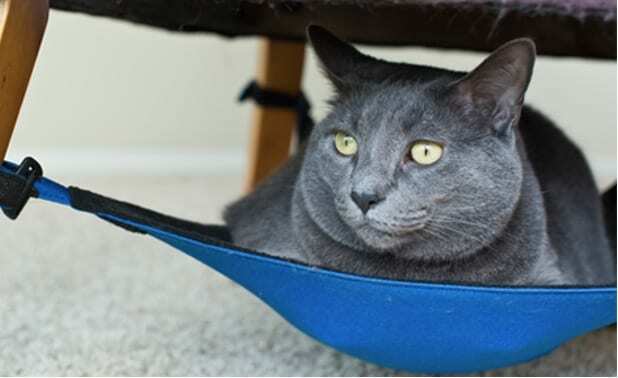 This cat carib is attached to the bottom of any chair and gives the cat a cool spot to lay and relax, something we know they love to do ALL THE TIME. This is also good if you have more than one cat and you want to give them each a space that is their own. Here’s a way to make sure no one touches your sandwich every again. Whether in the office or in your roommate apartment, putting you sandwich in this mold-colored sandwich bag makes it completely undesirable in moments. 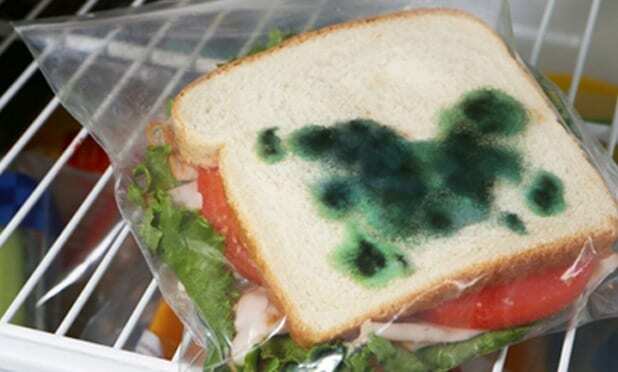 The sandwich itself is totally fine but the green moldy coloring is what makes it look gross by anyone who isn’t you. This little patent is called the Deterrent Moldy Sandwich Bags. For anyone who has a dog, you know that walking them in the rain is a total nightmare for the two of you. You get wet no matter what you do and the poor dog does too. 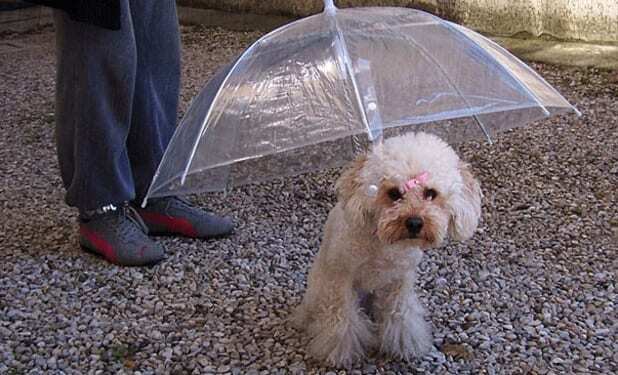 This invention, The Dogbrella, makes going out in the rain a breeze. Your pet stays dry which means you don’t have to deal with the wet dog smell (which no one likes) and your dog is comfortable the entire time. Why has it taken so long for this to be thought up?! 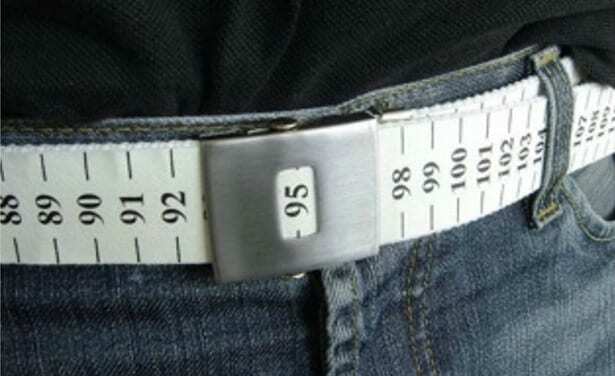 A measuring tape for a belt is one of the more cruel inventions on here in our opinion. If you are measuring your waist line on a daily basis, this one is for you. While we don’t advocate measuring every single day since what can change on a daily basis, but there are those who feel more comfortable with charting their waist line every day. BendDesk is a dream for those of us who like a huge screen to work with that actually extended to the entire desk as a whole. 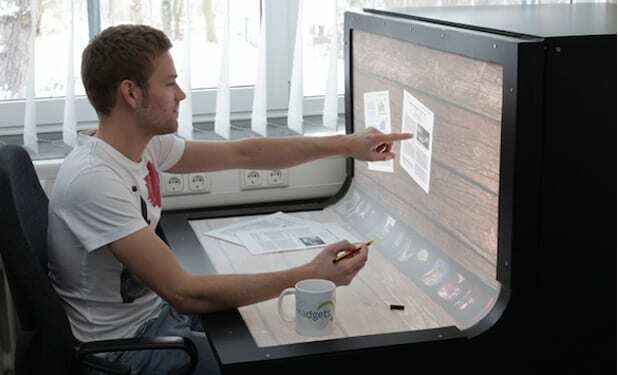 The touchscreen desk gives you control over the entire desktop but through your fingers. If you are an illustrator, designer or basically anything creative in the industry, this desk is one to fantasize about. It is the classic futuristic invention that we didn’t know existed. This one we have seen in the flesh and have to say is brilliant! you can use this device when it is connected to your phone and have a full keyboard for typing an email instead of using the small phone keyboard that many people have an issue with. 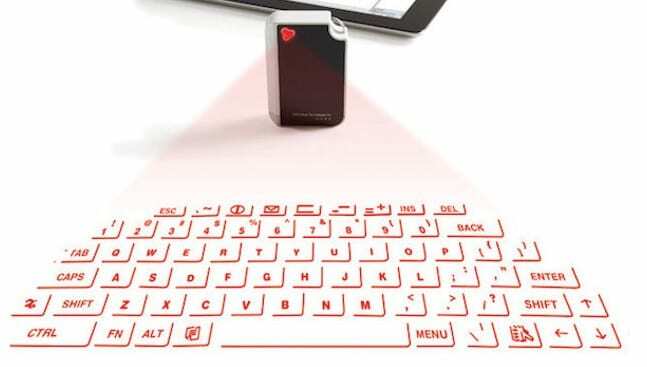 The keyboard works on bluetooth technology and connects to anything that has a bluetooth connection and can be adaptable per device.